ISOVER students contest 2010 dealt with the challenge refurbishment creates when also considering Passive House regulations. The 2010 theme was the same for all countries and consisted of refurbishing an old factory in Paris’ Pantin district. The site was well placed, next to a canal that divided the area into the industrial north and residential south. Our concept was to transform this building into a community center, following a long established trend of converting old industrial sites into community-centered entities. Given the proximity of industry we used as much color as possible, coloring the glass louvres. 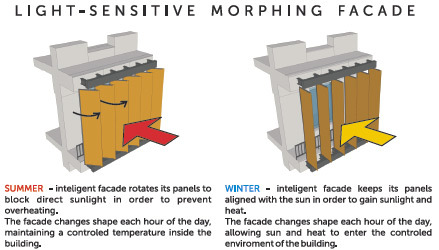 The whole system is computer-controlled so the louvres (shades) rotate with the sun, providing much needed shade in summer and light in winter, as well as a perpetual-changing facade. The top terrace is covered by a metal structure sustaining solar panels for both electricity and hot water, while, at the same time, shading the building itself. 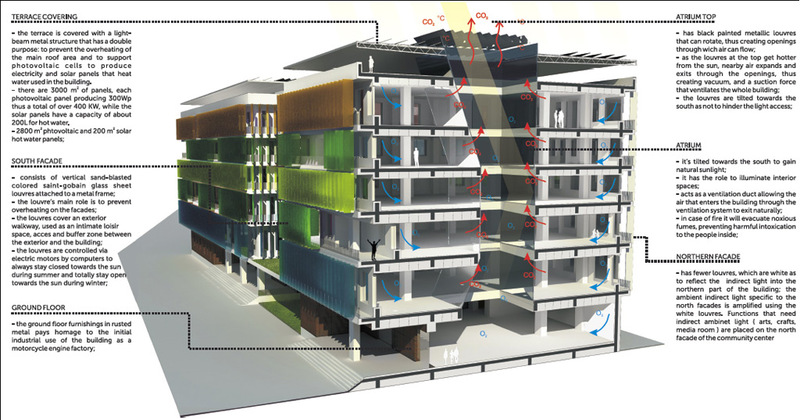 The north facade is more open with simple white non-movable louvres to let more light in. The site east of the building was changed into a park thus enhancing its role as a community center. Our entry for 1st place at the national stage of the competition.